Local Trade Copier v2.4 is finally here! I understand you may not have time or do not want to read this document, but to avoid any misunderstandings and asking questions that are already answered on my website, please read this to learn about the latest changes in the LTC v2.4. Ideally you should re-read the updated instruction manual as well. First I want to thank all of you who helped me to find errors in the LTC. I have been working really hard to fix them and make this software better than ever. Finally today the Local Trade Copier v2.4 is released. Now let’s take a look what has changed in the LTC v2.4. What’s new in LTC v2.4? #1 Better license, more options, bigger value. I have upgraded every single LTC license there is and have added new options. Even the smallest license has more options than ever before. From now on all licenses, except for the “Light” license, allows you to have unlimited number of master and slave accounts. #2 “Partial Close” feature is enabled by default. From now on the “Partial Close” feature is enabled by default. This means the Client EA has the MagicNumber=0 (zero) as default setting. This is the biggest change in this new release and it is the most important one, because previously magic number was set to 60000 by default. If you do not have open trades you can go ahead and upgrade to the new LTC version. But if you have open trades you should close them or set the MagicNumber to the one you have been using before. Best option here is to load previously saved settings. #3 Currency suffix auto-detection just got better. I have improved the code which is responsible for currency name suffix detection. Now LTC should have less trouble with this. #4 Third party trades are always allowed. Finally the Local Trade Copier allows you to have third party trades when you have “Partial Close” feature enabled. Previously this was a huge problem, but now that is no longer the case. #5 “Close By“ feature is now available. MT4 has this feature called “Close By” and it allows you to close two hedge trades of the opposite direction in one take and save commissions on one of those positions. From now on the LTC can copy these trading operations as well. This is something that only small number of people use and if you do not know what that is you should read about it in MT4 instruction manual or search for more info about it online. Here’s a good article about that. #6 A new Risk option was added called LotMoneyRatio. This is something a lot of people been asking me for several years already. It is not the most popular risk management option, but I still find it really useful. It allows you to set the Client EA to risk certain amount of lot size per trade according to the client account size. For example you can risk 0.1 lot size for every $1,000 USD in the account, so when that particular account grows to $2,000 USD it will automatically start using 0.2 lot size. Read more about this new option in the new instruction manual. #7 Trade copier works better with any non-Forex pair. I have improved the code that is responsible for detecting the pip size of any Forex and non-Forex pair. This have improved trade copying on pairs like GOLD, SILVER and many other non-Forex pairs. Also, a new option has been added called CustomPipSizes. I have added this option because there are no standard pip sizes for indices and other non-Forex pairs among brokers. This option allows you to override the pip size that the LTC will detect automatically. In 99% cases the new LTC will work fine on all Forex pairs, but for non-Forex pairs you might notice that the pip size is different among brokers. For example NAS100 with one broker might be quoted with 1 decimal and another broker might quote it to 2 decimals. Now using this new option you can enter a comma separated list of the custom pip sizes that your broker use. #8 You can set the Client EA to operate only during certain hours. DailyTimeFilterMode and DailyTimeFilter options have been added to the Server EA and Client EA. These options allow you to set one or multiple time periods to tell the EA when it is allowed to send or accept the trades from the master account(s). This allows you to set the EA to copy or not to copy trades during certain time periods every day. #9 You can set the Client EA to operate only during certain week days. IgnoreWeekDays option has been added. This is where you can set on which week days Client EA is allowed to receive trades from master account(s). Previously this was introduced in the Server EA, but now it is available in the Client EA as well. #10 You can set the EA to discard disallowed lot sizes. Every broker has lot size limitations and those are minimum lot size and maximum lot size. When the Client EA needs to open an order with a lot size that is off the broker’s limit it will automatically adjust the lot size and open a trade. Example would be if the broker’s minimum allowed lot size is 0.1 and a trade received should be placed using a lot size of 0.09, the Client EA will adjust that lot size to 0.1 and open it. The new DiscardDisallowedTradeSizes option allows you to set the Client EA to not adjust the lot size in such case and ignore that trade completely. #11 Allows you to ignore trades from a scalping strategy. MinTPAllowed option has been added and this is where you can set a minimum take profit value allowed to the trades on the slave account. EA will simply ignore the trade completely if the TP is too small. This feature was added to protect your account from the scalpers that open trades with a very small take profit values. #12 Set the trade comments for the copied trades. A new option TradeComment has been added. This allows you to set the trade comment for each trade that the Client EA will open. Note that it works only when MagicNumber is set to zero (default value). #13 More trade filters on the Server EA. Now you can filter trades on the master account by trade type and currency pair (symbol name). #14 New options added on the Server EA to adjust a Stop Loss and a Take Profit. The Server EA can now apply emergency stop loss if there is no stop loss on the trade before sending it to the clients. Also you can apply TP and SL multipliers. Note that this does not modify the actual trades on the master account, it will just send modified values to the client accounts. #15 You can ignore the trades that are too far from the master open price. A new option IgnoreTradesWhenTooFar has been added to the Client EA. With this option you can control if the Client EA should ignore or delay the trades that happened to be too far from the master open price according to your MaxPriceDeviationPips value. By default this option is turned off and this means the Client EA will delay the trade until the price will return within your reasonable deviation range. If you set this option to TRUE the Client EA will ignore the trade completely if the price is out of your allowed deviation range. I hope you will find these improvements useful. If you do not have a Local Trade Copier software it is the best time to buy Local Trade Copier right now. 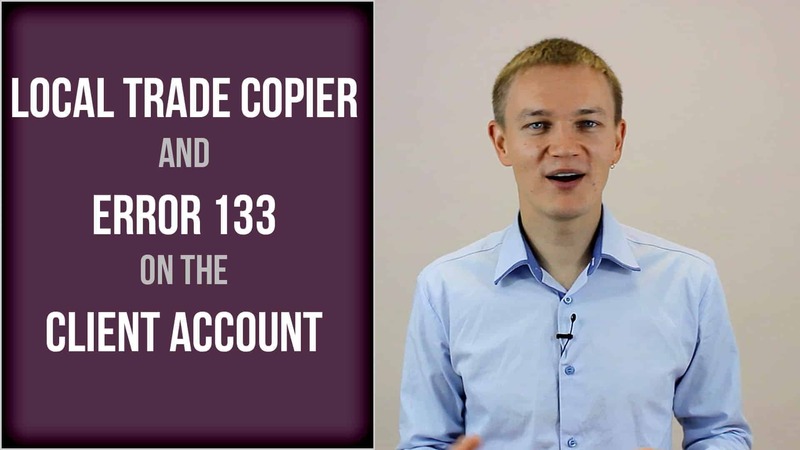 Local Trade Copier helps Forex account managers to copy their trading positions between multiple MetaTrader 4 accounts so they won’t need to repeat the same trade operations on each MT4 platform individually. I think it would have been a better video if you had stayed on camera one. Stephen, why do you think so?